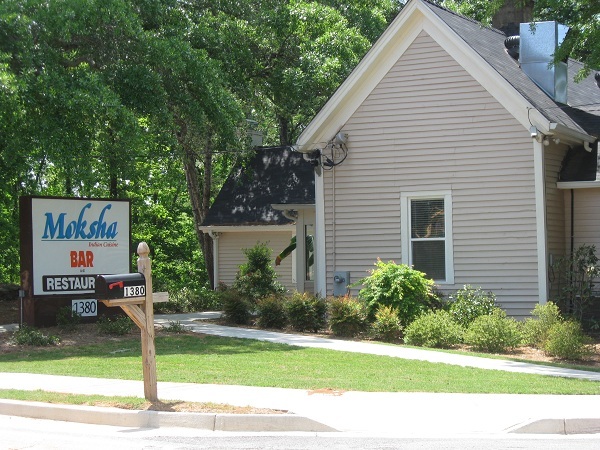 Moksha Restaurant and Bar, Roswell GA (CLOSED) – Marie, Let's Eat! “I found this amazing Indian restaurant,” Randy told me. I was skeptical. “They have an amazing lunch buffet,” he added. I was doubly so. I have a tolerate-hate relationship with Indian food, because I’ve found so little of it that rises above a very low batting average. I think I like the idea of it more than the reality, at least locally. Here, quite a few Indian restaurants, more than most of them, go for the fine dining experience, and I almost never feel that the quality of the food warrants the price tag. Since I emphatically do not need to be served by tuxedoed waiters nor eat from fine china and fancy tablecloths, eventually I started to resent paying for it. Now there was once a lovely little place in Smyrna which did it right: a no-frills presentation of extremely tasty food in styrofoam containers, and you could get out of there, extremely satisfied, for under seven bucks. I got to eat there only twice before I arrived once to see an “under new management” banner out front, fancy tablecloths masking the rickety and unbalanced tables, and a buffet. I don’t know that anything good had ever come from an Indian buffet in Atlanta prior to about a year ago. That was the first time I’ve ever chewed the manager of a restaurant out. I gave him an earful, telling him that raising the prices and making his restaurant exactly like the four restaurants that I drove past to get to his was amazingly stupid. I don’t know whether it was worth it or not, but I seem to recall they shut down within a year. I’ve tried lots of places in Atlanta. It seems that what passes for Indian cuisine in this town is, regardless of the trimmings and the tablecloths, pretty similar to the El-This-Los-That faux-Mexican meals that we used to get everywhere before enough of a Hispanic population developed for the owners to stop worrying about courting the Anglos and focused on people who knew the food from back home. That’s a topic for another chapter, I think, but it was a very similar experience: the restaurant would be called “Calcutta” or “Bombay” and claim to serve “authentic north Indian cuisine,” and have the same menu and the same flavor as another restaurant twenty miles away called “Taj Mahal” or “Sitar” which claimed to serve “authentic eastern Indian cuisine.” The sole, lone exception was a place in Chamblee called Himalayas, which was a little higher than the average, and where I had rogan josh for the first time. I’m not claiming that any of it’s really bad, but rather that I knew that my periodic cravings for sopping up a really hot vindaloo with fresh naan would be no different anywhere I went, much in the same way that I could indulge a really intense desire for chips, salsa, rice, beans and some kind of meat at any one of three hundred identikit Mexican places. Thank heaven I found Maizetos brand chips and Garden Fresh Gourmet salsa, otherwise I’d still be wasting money at some “El Sombrero” place once a week. And the buffet. Don’t get me started. It wasn’t just that I know about Randy and his all-no-fool-would-ever-eat Chinese buffets; one right after another, for years, everything on every Indian buffet in Atlanta came from the same damn kitchen. I give you this backstory to explain why it was, with a heavy heart and healthy skepticism, I agreed to accompany Randy to this buffet. Holy bajole. This place is amazing. Randy discovered Moksha because a buddy of his married into the owner’s family. That meant that Randy joined nine hundred and twenty people for a gigantic meal catered by them. He went to the restaurant, concluded that among Roswell’s many very good restaurants, this was a standout, and insisted that I join him. Now I must say that the city of Roswell clearly does not care how amazing a treasure their city has. They have made finding this place a complete headache via an ongoing, ages-long road construction project that has worked its way up Old Roswell Road all the way back to its intersection with Warsaw and has left one lamebrained detour after another in its wake. Old Roswell has, in fact, been shifted away from the restaurant, which now sits quietly at the end of where the street used to be, hidden well away from traffic and any potential impulse eaters. Moksha is now a place you have to search out; you cannot find it by accident. Despite the fact that its location cannot be good for business, it’s excellent for a quiet getaway. The restaurant is in an old farmhouse in the woods, with an event hall behind it. Randy remembers that the property used to belong to a fancy Southern cooking joint called Lickskillet, and it has a polite, isolated charm to it that lets you forget that you’re just a thicket of trees away from a bank and a dozen car dealers on Mansell. Inside, there are tablecloths and a buffet. I tried to remain strong, and was rewarded by a simply terrific meal. It is, by leagues, more flavorful and tasty than any other Indian cuisine that I have found anywhere in metro Atlanta. I don’t even pretend expertise, or even knowledge, of what I should be looking for in Indian food, but I’ll tell you this: the buffet is considerably smaller than most. The lettuce they use in the tossed salad is quite disappointing. Everything else is amazing. They have about four wonderful sauces for the salad which overcome the lettuce’s deficiency, and another little mix of chickpeas, onions and tomatoes in a light sauce which is incredible. For my main meal, I usually get some fried vegetable pakodas along with a big spoonful of rice, and then fill up with ladles of curry. They’ve had chicken tikka marsala each of the three times we’ve gone, and occasionally rogan josh. This time, it was lamb korma, cooked in a thick, spicy cardamom sauce with onions. The flavor is so strong, with a hint of mint. Desserts vary; often they have rice pudding, but not this time. Actually, I did really well this time and didn’t overdo it. The last time, Randy and I went late and they were ready to take away whatever we weren’t going to eat, so we ate everything. We got as far as the little airlock lobby and sat down again for about as long as we’d spent eating the meal. We were just about ready to call Marie to come get us, because neither of us could face driving home for quite some time. On Friday, I was much more sensible. I was still so stuffed at supper that I had about four bites of chicken and a forkful of rice and called it a night, but I didn’t have to undo my belt after lunch, either. I’m sure we’ll go back again. Maybe one day we can even go with Marie. We just need to time it right and not feel compelled to finish off every drop of the chicken tikka marsala’s creamy tomato curry. Temptation like that, I just don’t need. Sadly, Moksha closed at the end of August, 2010. Posted on May 3, 2010 July 29, 2017 by Grant G.Posted in atlanta, georgia, goodbye, indianTagged atlanta, closed!, georgia, indian, roswell. Pingback: Moksha Kitchen, Duluth GA – Marie, Let's Eat!